We left Munising, Michigan and had a great day on the water. We saw a Shipwreck in the Bay just a few miles out and that was so cool! 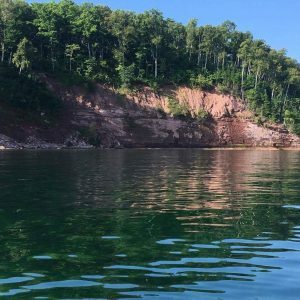 We encountered more rock walls and to our surprise we were more impressed by these than Pictured Rocks. We were able to see more color and the big bonus was that it wasn’t crowded and we didn’t have to deal with tour boats. We stopped on a small gorgeous island for our break and it was perfect, we could easily live there. The walls of the island were full of red layers, so pretty. 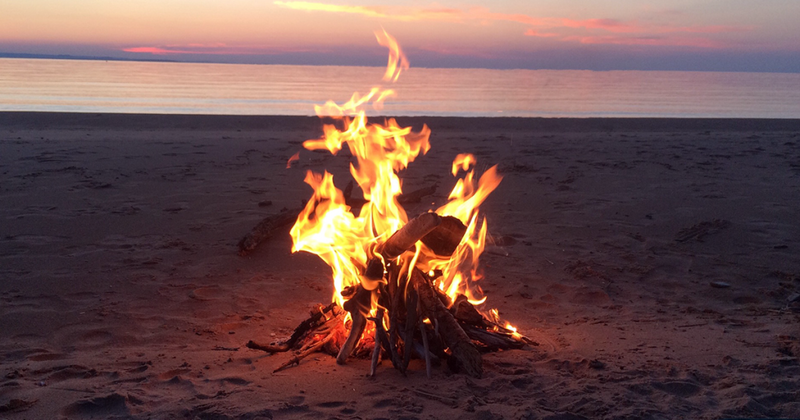 We ended our day on a sandy and private beach about 10 miles from Marquette, Michigan. It’s beautiful as always but it’s so hot. We had 48 this morning and 75 but the sun was beating on us. We have not adjusted to summer yet. We had a 30 mile day. 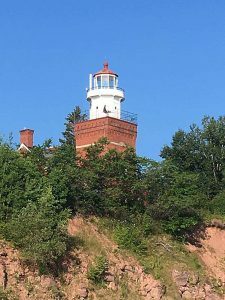 Crossed to Marquette, Michigan and beyond. We had several boats out fishing in this bay so it must be a local hot spot. The temps and water were great and lots of people out hiking on the rocks and enjoying the day, it’s nice to see. Had our lunch stop and just a few miles beyond that we were waved to a stop in a narrow spot between shore and a little island. 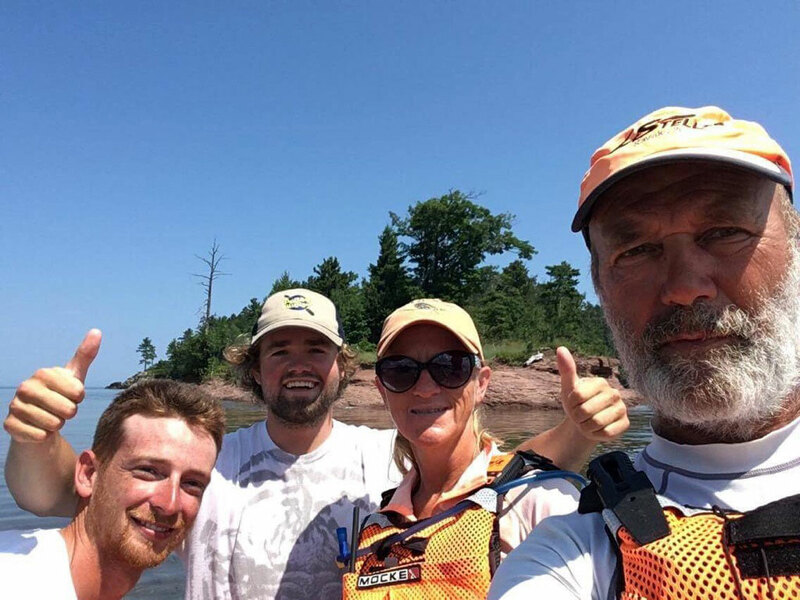 Two of the guides from Pictured Rocks, Ryan and Adam, who heard about us from Laura Coyour, she and her husband Doug had just paddled with Ryan. 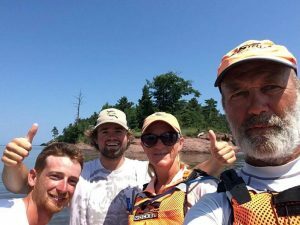 These guys are planning to paddle all of Lake Superior next summer and wanted to chat with us. We must have stood there for at least hour. We covered everything from boats and gear to food and maps. We wished them luck and promised some help, we can’t wait to watch their adventure. We continued on and the lake got rough. It took us a while to find a spot to pitch our tent but we found one. A rock garden but a really nice one. We made 28 1/2 miles. 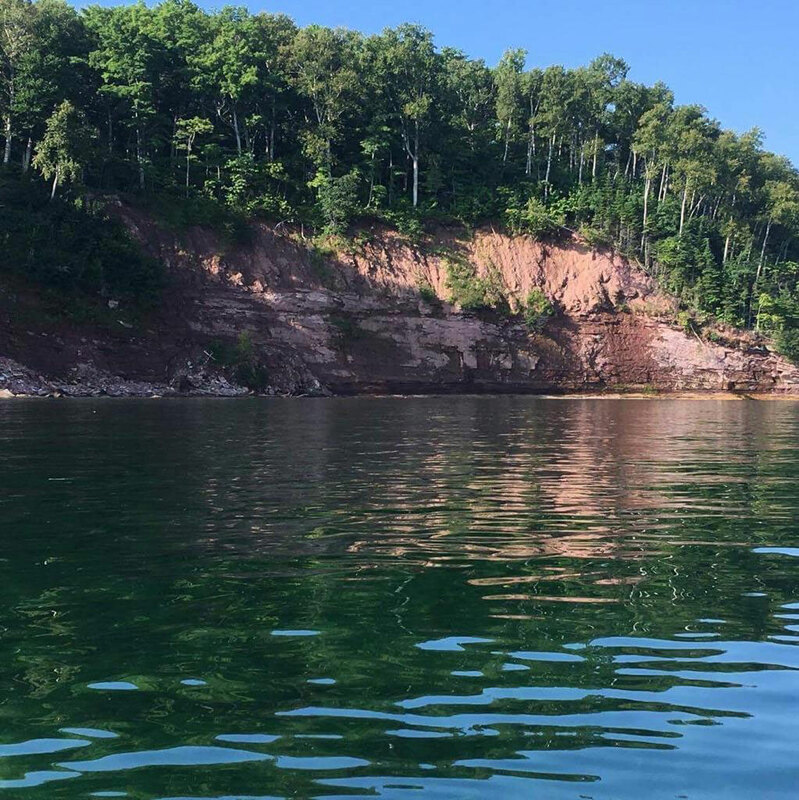 We were off at 7:30 on flat water, most of the day we paddled next to rock walls and yet again we found it to be more enjoyable than the area around Pictured Rocks. We got a picture of the Big Bay Lighthouse, it’s a pretty one and sits high on a ledge. When we pulled off for our lunch break we ended up getting a parade of camp kids and counselors hiking the beach and off into the woods. We actually saw 7 other kayakers today and that is so unusual. Today’s Bay crossing went very well and we were able to cut a few miles, always good. We found a perfect campsite on a rock at Point Abbaye, I’ve wanted to do that for a while now. It was so nice, the water was warm and we were able to swim and relax in the water. Our total for today was 33 miles. On the water early and decided to make a diagonal crossing of 12 1/2 miles to get to the start of the Portage River before the conditions deteriorated on us. It was rough but it felt good to be able to do it! The river itself was calm and pretty. We saw the most amazing barn, I could totally live in it! The river opened up into Portage Lake and that was a pain. The wind kicked up and it was a job just to keep the paddle in our hands. Back onto the river and we stopped due to storm warnings. We sat and got about 2 minutes of rain so back out we went. We had 2 1/2 miles to reach the bridge and Houghton/ Hancock, the last 1/2 mile is when the rain hit. It came like it was out of a fire hose…that got me into a laughing fit, don’t know why but it did. We pulled in at a small Marina and were greeted with paper towels, we were beyond that but it did dry our faces. This is the point where our day got good. We had the chance to meet some of our followers here. Joe and Sheila Tormala, Joe served in Iraq with my husband, they contacted us to meet here. They are sweet, fun and amazingly nice. We talked a bit at the Marina, they sent us to a hotel for the night, their gift. Then met up with us later to have pizza at Ambrosia, the pizza was so good. When in the area make sure to go, it can’t be beat and the building is beautiful. We will be keeping in touch with Joe and Sheila and plan to visit them again to be able to have a much longer visit. It was really nice to talk to someone that remembers Dan. Having a real shower and a comfortable bed with actual pillows was great. We slept in, the real bed was just to tempting. We had the continental breakfast and were on the water at 9:30. All worth it! 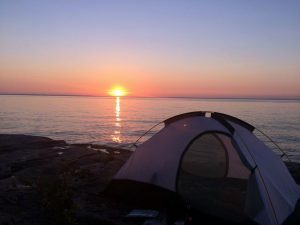 We made it up the river and back to Lake Superior only to find wind and waves. There we sat and waited and ended up camping there. Very pretty spot near the Stanton Township North Canal Park. It was funny to see all the other boats, big ones, get to the lake and turn around and head back the way they came from. It was a nice quiet spot and we spent the afternoon sleeping in the sun and walking the beach. On the water by 7, calm and pleasant. We had beautiful scenery and saw several waterfalls. The caves in the walls made whale sounds with the waves going in, it was cool! We stopped for lunch and the rocks on this beach were so different, lots of pinky red with white polka dots on them. Joe managed to get one into the boat for me that was 10 x 12 and it’s going to be a trivet. We headed back out and everything changed. The lake kicked up and got very rough. The first point was a huge challenge and the Bay got so crazy that we landed before the second point. We didn’t make it to Ontonagon, we landed and built a fire to warm up. Made camp and spent our first miserable night…not bad considering how long we have been out here. Crazy wind and raining so hard! We couldn’t leave our hiding spot today, we couldn’t even leave our tent till about 3. When we did get out and explore we found that we had a very nice area to be stuck in. We had a river in the woods behind us. We discovered an old abandoned and falling down shack with all the stuff still in it, along with grass growing up. It was fun to imagine who had lived there and what they did. A couple with a cabin farther down the shore walked up and we had a nice visit. They watched us paddle by yesterday and wondered how far we had gotten. 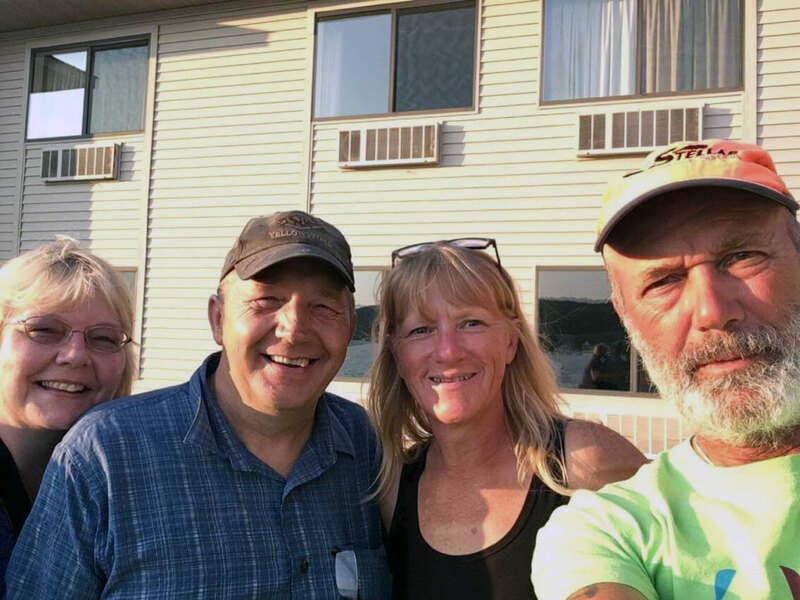 They are from Ontonagon and love to be out in the woods away from civilization so they can just relax and be. They were so nice. Everyone we have met and talked to on this trip has been enjoyable. Glad your safe and enjoying your trip, how far do you have left to go?